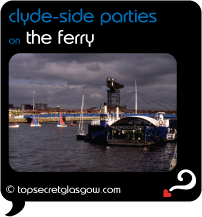 One of the most funky venues in Glasgow, The Ferry is moored at Anderston Quay, on the north bank of the river Clyde. Known as Renfrew Ferry since 1952, it has been transformed into vibrant floating palace of excitements! A restaurant with great views, room for concerts and dancing, and catering for all sorts of parties and celebrations keep the buzz alive and well on The Ferry. 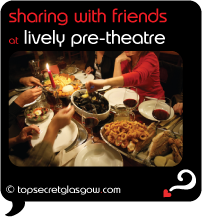 A spot of The Ferry pre theatre dining, be it intimate or with a bunch of friends, will set up your evening perfectly. And a drink or two is always a good idea. Many classy performers have graced The Ferry stage. So you're planning a Big Date or a special occasion, some intimate The Ferry pre-theatre dining will be perfect. Glasgow city centre has several funky lanes that you'd never enter, unless someone nods you the wink. Stereo is one of the most amazing bars that hides from view. A well stocked bar and vegan food combine to produce wonderful evenings. Sometimes its a pleasure to take a seat and watch the world go by. Choosing a bar nearby The Ferry helps to make this great fun. Hopefully you'll have some time to spare, when visiting The Ferry. Even if you're a local, its great fun to put a tourist hat on now and again, and do a little exploring. Across the Clyde from your venue, you'll spot some buildings that perfectly match the funky Armadillo shape of Clyde Auditorium. Glasgow Science Centre (tel: +44 (0) 871 540 1000) houses Glasgow IMAX cinema, the glorious tower and more 'hands on' science experiments and showcase demos than you know what to do with. Kids are NOT a requirement...;-) Have a fun time here. Remember your camera! Towering close to your venue, and gleaming every day, the landmark The Crowne Plaza /Browse/Restaurant/One_Restaurant_at_the_Crowne_Plaza(reveal best table deals?) welcomes guests for chic, modern stays. Views along the river, top service and facilities make this a fave place to stay, for very good reasons. In line with the city's well deserved reputation as a very friendly place to visit, it makes sure lovely times are had by all, no matter the size of the budget you're working with. Just along Broomielaw from The Ferry, Jurys Inn http://www.laterooms.com/en/p8275/hotel-reservations/73764_jurys-inn-glasgow-glasgow.aspx(reveal best room deals?) looks after guests very well indeed. 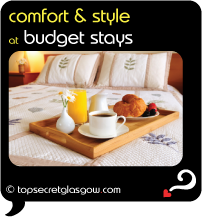 Comfy mid-range rooms and access to just about everything in the city centre make for stays you'll long remember. How was your evening? Bet you had fun, making waves while the music swayed into the night! How about keeping your memories alive, and sharing them with everyone? 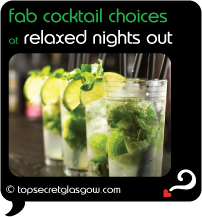 Send us your story here, and we'll publish your very own Top Secret Glasgow pages on the web. Totally free, of course. Add a photo if you have one. Then you can impress friends and family with the fun times you're having in Glasgow, on and nearby The Ferry. Great news! Finding this page means you can now join our VIP list for The Ferry. And you can click the 'share' button below to add a (social) bookmark or email a friend. 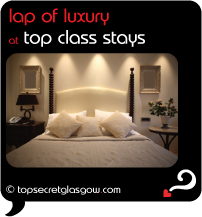 Grab your spot of pampering with our VIP Classic service and look forward to your monthly ezine of only the best of the best of Glasgow. For ALL of our news about Glasgow, as it happens, subscribe to our regular blog so you don't miss a thing - just click the 'RSS' button below. get your vote in NOW! Grab your very own web page all about The Ferry. get started with 'my-page' NOW! Do you have a special story about The Ferry? A funny experience? A grand occasion? A funky photo? A personal tip? A top secret? 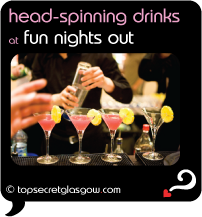 Be a "Top Secret Glasgow VIP". We are always working on all sorts of new features... the most buzzing events... the "insiders" low-down... the key to the very best of Glasgow. We'll reveal top secrets that many locals don't even know about - often in the shadows of the classics. If you want to be first onto these new top secrets, then just use the simple form below to pass us your email address and first name. We'll be in touch... "confidentially"! If you love here as much as we do then you'll want all of their latest news, tips and top secrets. Here's your chance to get into our 'top secret news' file just for fans like you. Just pop your email address and your first name (so we can keep this friendly!) in the boxes below and hit the "let me in" button. You'll be first to hear. We promise to use it only to send you news about this top place. Opening hours vary, depending on concert and event times.